Presented like a trifle, this NILLA Tiramisu has all the lusciousness of the classic dessert but is a whole lot easier to put together. Win-win! Beat cream cheese, sugar, vanilla and 3 Tbsp. of the coffee in large bowl with mixer on medium speed until well blended. Stir in 2 cups COOL WHIP. Spoon 1/3 of the cream cheese mixture into 1-1/2-qt. serving bowl. 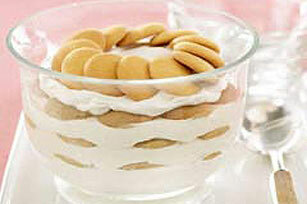 Dip 9 wafers into remaining coffee for about 5 seconds; place evenly over cream cheese layer. Repeat layers twice. Cover with remaining COOL WHIP. Refrigerate at least 1 hour. Top with remaining 12 wafers just before serving. Garnish with a sprinkling of unsweetened cocoa just before serving.